Cheap eats by the lake: JJ's Cafe in Lake Village. Saturday morning before heading over to Lakeport Plantation, Grav and I headed to JJ’s Lakeside Café for breakfast. The smart little restaurant sits on the east side of US 65/82 on the south side of Lake Village over by the Visitors Center. Coverage of my south Arkansas trip continues at Tie Dye Travels… and intersects with my quest for the best breakfast in Arkansas. We arrived around nine and were told to sit where we like. Our waitress came over and handed us menus and asked us what we wanted to drink. It had been a very long and productive day the day before, and I needed an eye opener, so I got coffee. Grav stuck with his Mountain Dew. The thing that struck me first about the menu was the prices. Everything on the menu was under $5. The most expensive item was the International Omelet ($4.59) but most items were in the $1-3 range. I spotted exactly what I wanted right off the bat — the Bean Boy Omelet ($3.99), which appeared to be a traditional veggie omelet. Grav went for a single pancake and an order of two biscuits with gravy. We noticed that there were other people working on putting a food bar together, apparently for lunch. A big tray of hot dark rolls had just been delivered. The smell of fresh baked bread steamed through the restaurant. Our waitress returned with a cup. My coffee was still bubbling, almost boiling. I looked up at her. “All right.” She was gone and I stared at the still bubbling coffee. That was some hot coffee — and it was served in a Styrofoam cup, at that. I had to shoot the bubbling, steaming cup. “You take pictures of things?” She had returned with Grav’s drink and her notepad. We ordered. I was still marveling at the coffee, which had returned to a simmer. We noticed a small group of motorcycle enthusiasts pull up wearing their rain gear. They came in and commandeered a couple of tables on the other side of the restaurant. A few minutes later, about the time I could manage a sip of coffee, our orders arrived. My omelet was a rolled omelet instead of a tri- or bi-fold, and it languidly stretched off the edge of the plate, accompanied by four triangles of golden brown toast. After our usual shooting of the foods, I was very hungry, so I went ahead and dug in — and was surprised when I momentarily set my mouth on fire. I immediately went to quench my thirst and nearly seared my taste buds with the coffee. What the heck? Now, I always take photos of the menu where I’m at. So I turned on the camera again and flipped it back to the menu photo. 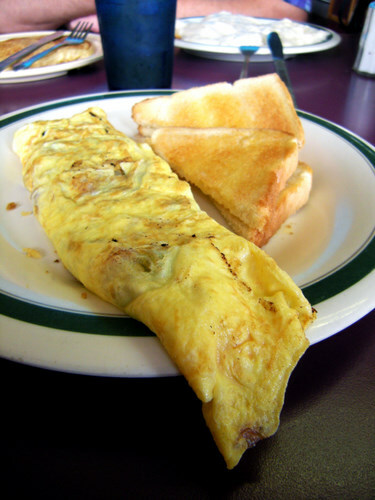 “The Bean Boy Omelet” - mushroom, bell pepper, jalapeno, onion, tomatoes, cheese. Yeah, I’d missed it. But it was really good. I pushed a few jalapeno bits to the side and went back to trying it out. “You have to try this pancake,” he told me. I lifted my fork his way, and he nodded. I cut a little with the side of the fork and tried it. He was right. This wasn’t your average pancake. This was more like a flat corn muffin — very cornmealy (but still soft) and cakey, and definitely sweet. It wasn’t too sweet, though. It was very different from most pancakes I’ve encountered. “That’s good,” I told him. The biscuits and gravy, by the way? White gravy, which meant I could try it. These were good nice and flaky biscuits underneath all that very gelatinous gravy. And it wasn’t like this was an expensive meal. Pancakes are just $1.59 and a full order of biscuits and gravy $1.99. Our total bill came to $12.29. And thing is, we didn’t finish everything we got. But we had to move on. We had our assignment at Lakeport Plantation.Turns out we ate so well we didn’t stop again for food until we got to El Dorado that evening after a full day of work. You can find JJ’s Lakeside Café by the Visitors Center in Lake Village. They’re closed Monday and they don’t serve breakfast on Sunday, but they do have a daily lunch buffet I’ll have to try out at some point. (870) 265-9800.